I’m a twin. 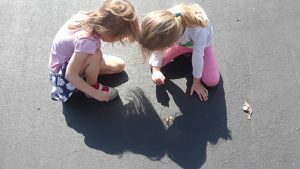 I’m raising (and homeschooling) twin girls. My dad’s a twin. I’ve nannied and babysat for twins, have friends who are twins, and have taught twins in a public school setting. Like it or not, twins will always be compared to each other. Whether we like it or not, whether we actively encourage or discourage it, twins are barraged with comparisons. We even do it to ourselves. 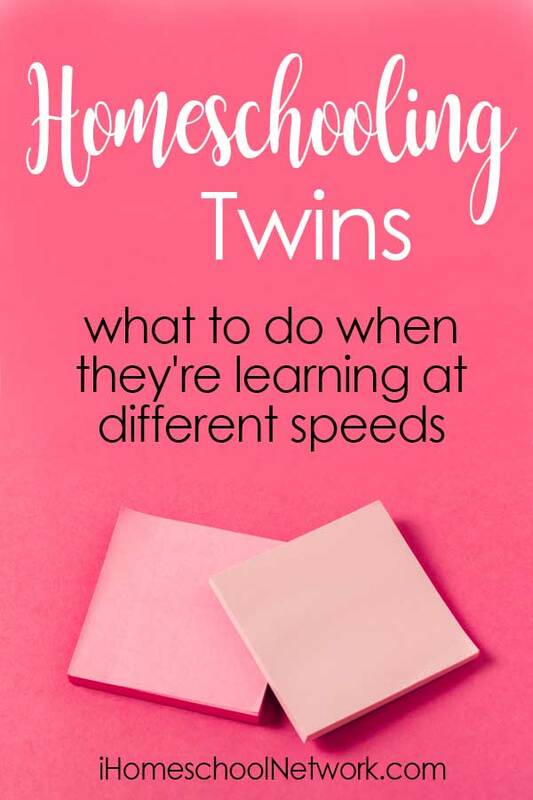 That comparison can seem harmless, but over time, they can be harmful to the twins’ identities and development, and not just for the one who is deemed “less.” As homeschooling parents, there are ways we can minimize the damage of comparisons and strengthen the overall family bonds at the same time. 1 – avoid the red pen. Especially in the early years, there is no need for grading. Instead, collaboration and revision should be encouraged. When you work together, you can catch errors or confusion in real time and can gently teach or correct without the stigma of having gotten more “wrong” than the sibling. In most of the world, especially non-western countries, collaboration in learning is expected and encouraged. Because we can be flexible in our coursework and have no need for daily grades, let them work together. The stronger twin can coach the weaker, and the same may happen in reverse in another area. There’s nothing wrong with this. In fact, it’s great practice for adulthood as team work dynamics. 3 – work separately in weak areas. 4 – use older and younger siblings or friends as collaborators. If there are other siblings or friends in the mix, enlist them to help out. This is one of the most underutilized resources in homeschooling. Find someone, whether a gentle older sibling or an adoring young fan, to spend time with one twin while you work with the other. Reading or writing for younger siblings or helping them practice skills can be a great, non-threatening reinforcement. Older siblings or friends often enjoy (in moderation) the opportunity to coach and can be a great resource and encouragement. 5 – encourage different interests. Twins don’t have to be the same, have the same interests, or friends, or activities. If you notice them struggling or comparing more than is healthy, find separate activities, especially once the tween and teen years hit. As they’re working to form their identities, they will value time and space to be an individual. 6 – avoid comparative language. It’s not about who was first, or better, or more precise. Twins are individuals whose accomplishments and struggles stand on their own, regardless of what a sibling has or has not done. I can have a hard day, and it is valid, even if my twin’s day may have been harder. I can have an experiment I can be proud of, even if my sister’s was flashier or more in-depth. My work and emotions exist in a separate space from hers and do not need to be compared in order to validate them. My twins are awesome. They both have unique and amazing strengths. One has eagle eyes and can see anything out of place, can see a bug a mile away, and can point out whatever has changed. The other is amazingly in tune with others’ emotions and what people need. At 4, she was already reminding me to unplug outlets before we left for trips and making sure we had all we needed. Celebrate who they are as individuals. 8 – model a growth mindset. It’s not about who’s fastest. It’s about eventually getting there. We talk about that all the time with our kids. One of my twins didn’t walk until 21 months, but she’s now just as coordinated as the other two. We talk about ourselves as well, what we remember as being hard, what things took longer for us. It’s hard with skills-based tasks. My twin sister and I both took violin lessons, and we didn’t always progress at the same rate. Now my kids are learning to swim and have different comfort and proficiency levels. That’s ok. We’re not comparing. We give them the time they need – no rush – trusting that they will eventually get there. 9 – work with personal bests, if you use numbers. Numbers are tricky – test scores, race times, grades, number of goals scored. They make it very easy to want to compare. Instead, talk to each about their own numbers as if the twin’s didn’t exist. You ran a 10 minute mile. Good for you. You got a 92 on a test. Good for you. That was better than the last one. Their successes and failures are completely valid, independent of the other. I always got a slightly lower test score than my twin sister. Always. After I’d helped her study and explained the material. That doesn’t mean I wasn’t successful or good enough, though, just because she was “better”. Our parents did a good job not using the other as a standard. They may have used the whole class average or a personal goal, but never the twin. 10 – find twin role models and talk about their experiences. Do you have people to talk to, to watch how they deal with being half of a pair? Growing up, we had the Bobbsey Twin books (aff link), the TV show Sister, Sister, and of course we had my dad, as the in-home twin expert. It’s important to have people who understand the unique set of challenges twins face. There are local twin organizations, Facebook groups, and other ways to connect with people who understand where you’re coming from. Being a twin is great. You have a built-in sounding board, friend, and confidante. It’s a unique gift, and with that unique gift also come unique challenges. On the whole, treat your kids like the amazing, unique individuals they are, regardless of birth order or singleton or multiple status. They all need to be seen, loved, and appreciated for who they are. They need to be given space to find their own identities and know that they are valued as individuals. Creative, amazing, inspiring individuals. Heather is a second generation homeschooler raising three amazing kids on Long Island, NY. She blogs at wonderschooling.net about curiosity, creativity, and empowering children to discover the world around them.